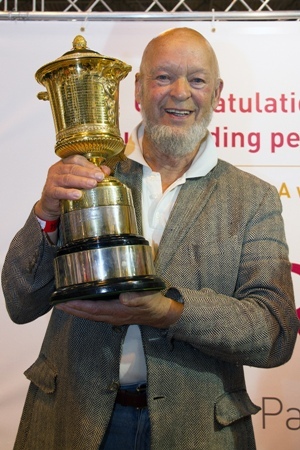 Michael Eavis from Glastonbury, Somerset is the winner of this year’s NMR/RABDF Gold Cup. This 230ha unit, that carries the 385-cow Holstein Friesian herd, is managed on a day-to-day basis by husband and wife team John and Pam Taylor with help from a team of four dairy staff. Regular meetings with Michael are used to monitor progress, set targets and develop new ideas. RABDF chairman of judges Lyndon Edwards, NMR Chairman Philip Kirkham and 2011 Gold Cup winner Tom King, described the unit as unique in its building layout and exceptional in the attention to detail. Positive environmental impact has been achieved through the sympathetic design, while internal layout has ensured that the highest standards of cow health and welfare are met which is being reflected in performance,” says Mr Edwards. The herd is averaging 12,101kg of milk at 3.96% fat and 3.11% protein on twice a day milking with an average lifetime daily yield of 15.39kg. The average somatic cell count is 173,000/ml and the calving interval is 398 days. Runners up and recipients of the NMR Silver Salver for the second year in succession are David, Sheila and James Tomlinson who manage the 230-cow Bilsrow Holstein herd from Bilsborrow, Preston in Lancashire. Breeding decisions are based on a balance of type and production and have always underpinned the progress and success of this herd, which achieved an average yield of 10,942kg of milk at 4.34% fat and 3.10% protein on twice-a-day milking. The Chris May Memorial Award, for the herd with the highest average lifetime daily yield among Gold Cup qualifying herds, goes to the 2013 Gold Cup winner, the Higgins family from Wilderly Hall, Pulverbatch, Shrewsbury. Managed by Bill and Margaret with sons Bill and Andrew, the 350 pedigree Holstein herd produced 12,663kg of milk on three times a day milking and achieved an average lifetime daily yield for the herd of 18.42kg/day. Running a dairy farm on the Festival site certainly comes with its challenges, but attention to detail means the dairy unit is going from strength to strength. Over the past few years herd manager John Taylor, in conjunction with Michael Eavis, has made considerable changes at Worthy Farm, with dramatic results. “We’ve also changed the diet. “Maize has replaced apple pomace which has boosted cow health.” As the music festival takes over the whole farm in June each year, maize is grown on contract, and the cows are housed on sawdust and shavings over mats for most of the year. The team is still making changes and aims to push cow numbers from 385 to 500 in the next few years and to possibly increase milking frequency – perhaps using robots in the longer term to improve the quality of life for staff and cows alike. Responsibilities are shared on this 154-hectare unit. James Tomlinson takes care of milking, fertility and health with the help of an assistant herdsman James Billington. His father, David, looks after the land work and feeding and mother Sheila is in charge of calf rearing and the office. Milk is sold to Pakezza Dairies in Rochdale who produce flavoured yoghurt that are listed with all the big supermarkets as well as in local Lancashire shops. With cow numbers now at 230 and 210 youngstock and more land recently acquired the Tomlinsons are set for expansion. Also presented at the Livestock Event was the Lilyhill Cup for the top Jersey herd and the Murchland Cup for the top Ayrshire herd among this year’s 957 Gold Cup qualifying herds. Winner of the Lilyhill Cup, awarded by the Jersey Cattle Society, is GM & DJ Pye from Carnforth, Lancashire. This 187-cow herd achieved an average yield of 6028kg at 5.59% fat and 3.77% protein. Brown & Beer from Bideford, Devon is runner up. The Murchland Cup, awarded by the Ayrshire Cattle Society, went to Gavin Lawrie from Monkton, Prestwick. This Ayrshire herd of 140 cows achieved an average yield of 8698kg of milk at 4.17% fat and 3.43% protein. John Adamson & Son from Lanarkshire is this year’s runner up.